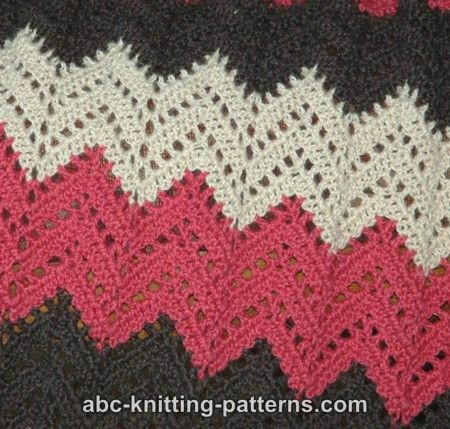 The ripple afghan is a classic pattern that probably every crocheter is going to try at some point. 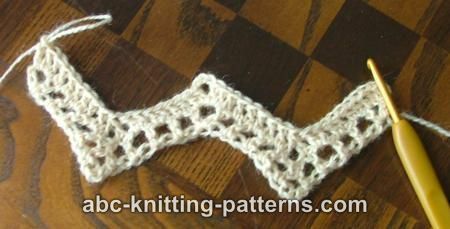 My version combines the ripple idea with filet crochet. 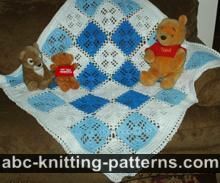 This gives it a lighter, airier texture than the traditional ripple afghan. 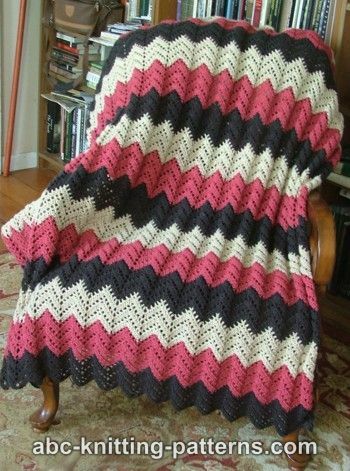 Everything about this afghan is easy to customize. The color choices are of course up to you, as is the width of each color band. 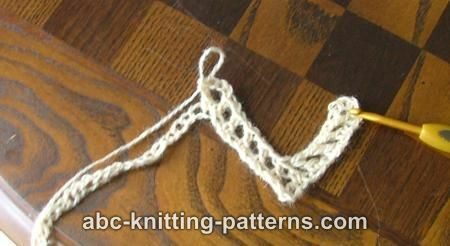 To change the width of the afghan, you simply change the width of the starting chain. It has to be a multiple of 20 plus 5. 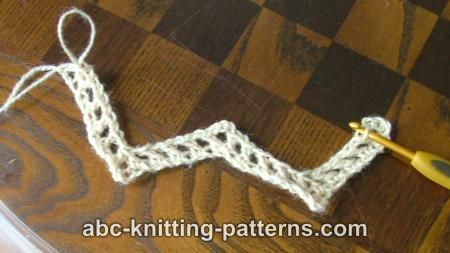 Gauge: 3" (7.50 cm) - 1 pattern repeat. Decrease: yo, insert hook in the next st, yo and pull up a loop, yo and draw through 2 loops on hook, yo, skip next 3 sts, insert hook in next st, yo and pull up a loop, yo and draw through 2 loops on hook, yo and draw through all 3 loops on hook (counts as one dc). Multiple of 20 plus 5. Chain 345 with yarn A. Row 1: Dc in the 5th ch from the hook (4 skipped chains count as the first dc plus 1 ch), ch 1, skip next ch, (dc in next ch, ch 1, skip next ch) repeat 3 times, decrease as follows: yo, insert hook in the next st, yo and pull up a loop, yo and draw through 2 loops on hook, yo, skip next 3 sts, insert hook in next st, yo and pull up a loop, yo and draw through 2 loops on hook, yo and draw through all 3 loops on hook (counts as one dc), *ch 1, skip next ch, (dc in next ch, ch 1, skip next ch) repeat 3 times, (dc, ch 3, dc) in the next ch, ch 1, skip next ch, (dc in next ch, ch 1, skip next ch) repeat 3 times, decrease*, repeat from * to * 16 times, ch 1, skip next ch, (dc in the next ch, ch 1, skip next ch) repeat 3 times, (dc, ch 1, dc) in the last ch. Row 2: ch 3 (counts as 1st dc), turn, 2 dc in the 1st dc, dc in the next ch 1 space, (dc in next dc and in next ch 1 space) repeat 3 times, decrease, *(dc in the nxt ch 1 space and in the next dc) repeat 3 times, (2 dc, ch 3, 2 dc) in the next ch 3 space, (dc in the next dc and in the next ch 1 space) repeat 3 times, decrease*, repeat from * to * 16 times, dc in the next ch 1 space, (dc in the next dc and in the next ch 1 space) repeat 3 times, 3 dc in the last dc (last ch-1 space and last dc is actually ch-4 at the beginning of previous row). Row 3: ch 4 (counts as 1st dc plus ch 1), turn, dc in the 1st dc, ch 1, skip the next dc, (dc in the next dc, ch 1, skip next dc) repeat 3 times, decrease, ch 1, (skip the next dc, dc in the next dc, ch 1) repeat 3 times, *(dc, ch 3, dc) in the next ch 3 space, ch 1, (dc in the next dc, ch 1, skip next dc) repeat 3 times, decrease, ch 1, (skip next dc, dc in next dc, ch 1) 3 times*, repeat from * to * 16 times, skip the next dc, (dc, ch 1, dc) in the last dc (last dc is a ch-3 at the beginning of the previous row). Repeat rows 2-19 six times. Repeat rows 2-7. Tie off. There are 75 total comments on this article. I updated the instructions with the pictures of the first 2 rows. 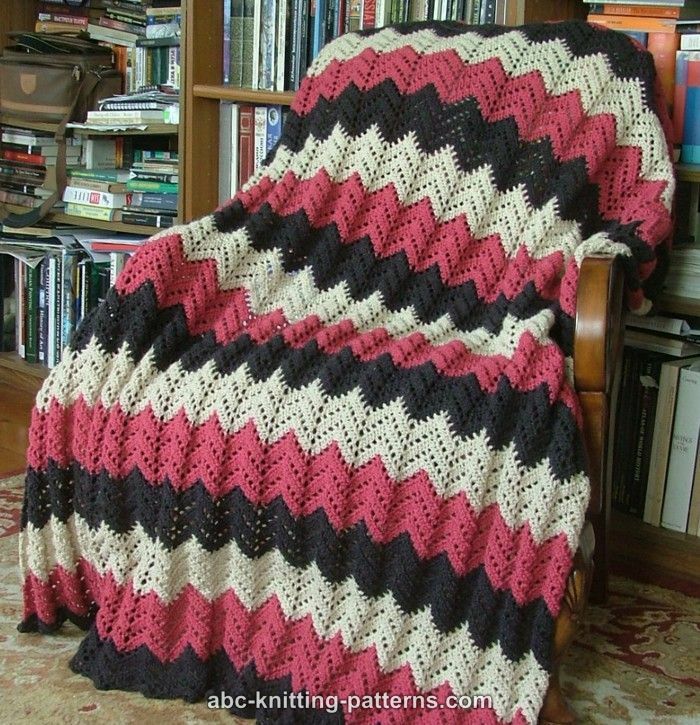 You can crochet this afghan in any yarn. If you have the same gauge, you'll get the same size. To make it 4" wider, just increase for 1 repeat. 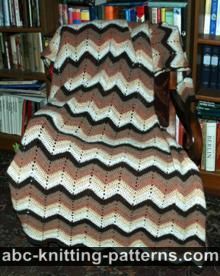 To make it longer crochet more rows. 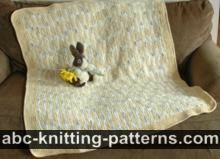 For baby blanket crochet 12 pattern repeats instead of 16. O.K. I have it printed now Thanks Lovely work. I to had issues when I got to the 3rd row. So I took everything out and started over but this time I chained 1 after each stitch on row with an exception on the dc2 ch3 dc2 I left that exactly the same. It then worked for me. You seem to have had the same issues I'm running into and am curious how you finally got the pattern to work for you. I'm usually pretty good at reading patterns and reworking them but I am at a loss with this one. And the diagram is no help since it seems to have extra stitches compaired to the picture and instructions. I will take any and all advice if someone can help. Thanks!